Leetah is a powerful healer with the ability to mend wounds of mind and body with a touch. She is gentle and nurturing, yet fierce and tenacious when using her powers to protect those she loves. She is a Sun Villager who joined the Wolfriders after her Recognition to their chief, Cutter. Though she now lives in the forest and follows the ways of the nocturnal Wolfriders, Leetah remains a creature of light and there is a feline elegance to her golden beauty. With the combination of her healing power and maternal wisdom, she holds a position of honor with both the desert and the woodland tribes. She was born in the desert Sun Village of Sorrow’s End during a time of unprecedented bounty after years of desperate drought. Her birth and her healing abilities made Leetah a symbol of hope and prosperity for the Sun Folk. She grew into adulthood knowing few wants or sorrows. Coddled and sheltered, she enjoyed her position but took her power for granted. 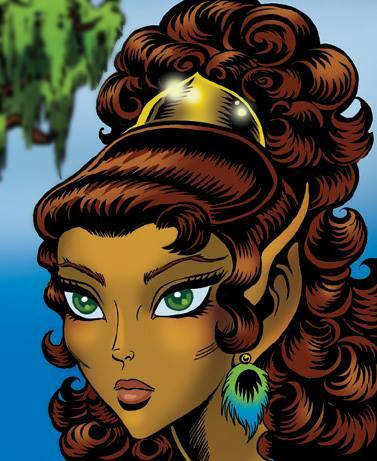 If, like her proud lovemate Rayek, Leetah developed a naïve sense of arrogance, the Sun Folk didn’t complain. Despite her significant healing abilities (and perhaps because of them), Leetah feared situations that she could not control. When fellow Sun Villager Thiro was killed instantaneously by a kick to the head by an angry zwoot, Leetah realized that her power over injury wasn’t absolute. It took a near-fatal, self-inflicted wound for the beautiful healer to fully face and appreciate her greatest enemy, Death. The experience matured her considerably. Her world changed forever when the Wolfriders discovered Sorrow’s End and she Recognized Cutter. Literally swept off her feet, suddenly feeling her very soul bared to a complete stranger, Leetah rejected the bond and the loss of control it represented to her. She shut herself off to Cutter and staved off the afflictions of denied Recognition. Eventually, heeding the advice of her younger sister Shenshen, her mother Toorah, and Savah, the wise Mother of Memory, Leetah realized that her connection to Cutter was less limiting than she at first feared. Despite the protestations of Rayek, she eventually accepted the bond and she and Cutter became lifemates, giving birth to the twins Suntop (later Sunstream) and Ember. It is a decision she has never regretted. Later, she left her village home to go with the Wolfriders on a mission to warn Cutter, on a quest to find and unite other elf tribes, of impending danger. The desperate pleas of the Sun Folk for her to stay made her realize that indulging her people by healing every tiny hurt had actually weakened them. While death will always be her enemy, she resolved to respect for the lesson of pain. She has faced many dangers on her adventures with the Wolfriders, from humans, from trolls, from the mysterious and dangerous anti-healer Winnowill, and even from her former lovemate Rayek. Through it all she’s learned to expand her abilities beyond the simple healing of wounds to include flesh-shaping, extending the lifespan of mortals and even causing injury. Her abilities have saved the lives of many on those quests, yet she is not always triumphant. In one instance of well-intentioned but misguided pride, she even attempted to cheat death itself, with disastrous results. She now knows when to give all, and when to hold back for the good of her people. More importantly, she has learned to ask permission to use her powers, rather than impose them on others. Like her lifemate, she has emerged from her many adventures a different, more mature elf. 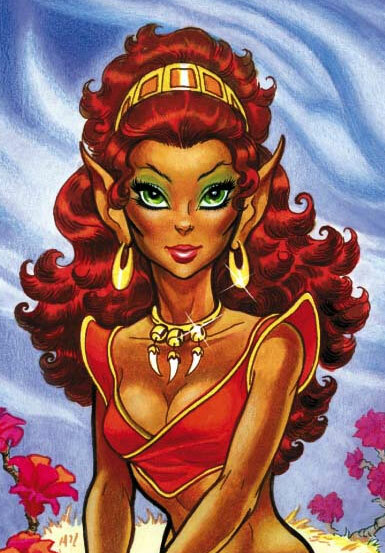 Leetah inherited the role of Mother of Memory to the elves remaining on the World of Two Moons when Savah returned to the Star Home in the Palace of the High Ones. I’ve been wondering about something. In some pictures leetah is standing by cutter and she smaller then he is and in others she is taller. Was she originally smaller and the magic of the palace making her taller or am I misunderstanding her size? Hmm, can you post a pic where she is taller than him? Could be she’s standing on higher ground than him.